Posted on September 5, 2014, 12:02 pm, by Google Webmaster Central, under crawling and indexing, search results, structured data. When users search for a company by name—for example, [Megadodo Publications] or [Dunder Mifflin]—they may actually be looking for something specific on that website. In the past, when our algorithms recognized this, they’d display a larger set of sitelinks and an additional search box below that search result, which let users do site: searches over the site straight from the results, for example [site:example.com hitchhiker guides]. This search box is now more prominent (above the sitelinks), supports Autocomplete, and—if you use the right markup—will send the user directly to your website’s own search pages. How can I mark up my site? You need to have a working site-specific search engine for your site. If you already have one, you can let us know by marking up your homepage as a schema.org/WebSite entity with the potentialAction property of the schema.org/SearchAction markup. You can use JSON-LD, microdata, or RDFa to do this; check out the full implementation details on our developer site. If you implement the markup on your site, users will have the ability to jump directly from the sitelinks search box to your site’s search results page. If we don’t find any markup, we’ll show them a Google search results page for the corresponding site: query, as we’ve done until now. As always, if you have questions, feel free to ask in our Webmaster Help forum. Posted on August 7, 2014, 6:13 am, by Google Webmaster Central, under advanced, beginner, intermediate, search results. 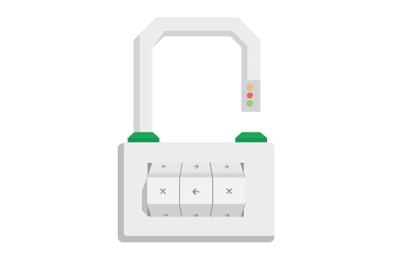 For these reasons, over the past few months we’ve been running tests taking into account whether sites use secure, encrypted connections as a signal in our search ranking algorithms. We’ve seen positive results, so we’re starting to use HTTPS as a ranking signal. 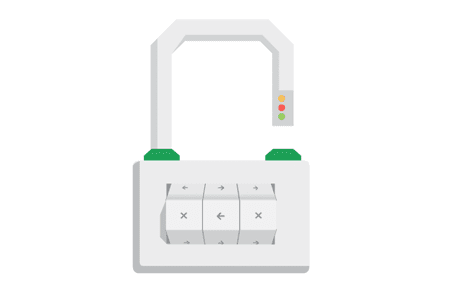 For now it’s only a very lightweight signal — affecting fewer than 1% of global queries, and carrying less weight than other signals such as high-quality content — while we give webmasters time to switch to HTTPS. But over time, we may decide to strengthen it, because we’d like to encourage all website owners to switch from HTTP to HTTPS to keep everyone safe on the web. Posted on July 15, 2014, 6:54 am, by Google Webmaster Central, under search results. Android app indexing is now open for everyone! Posted on June 25, 2014, 7:30 pm, by Google Webmaster Central, under crawling and indexing, mobile, search results, webmaster tools. 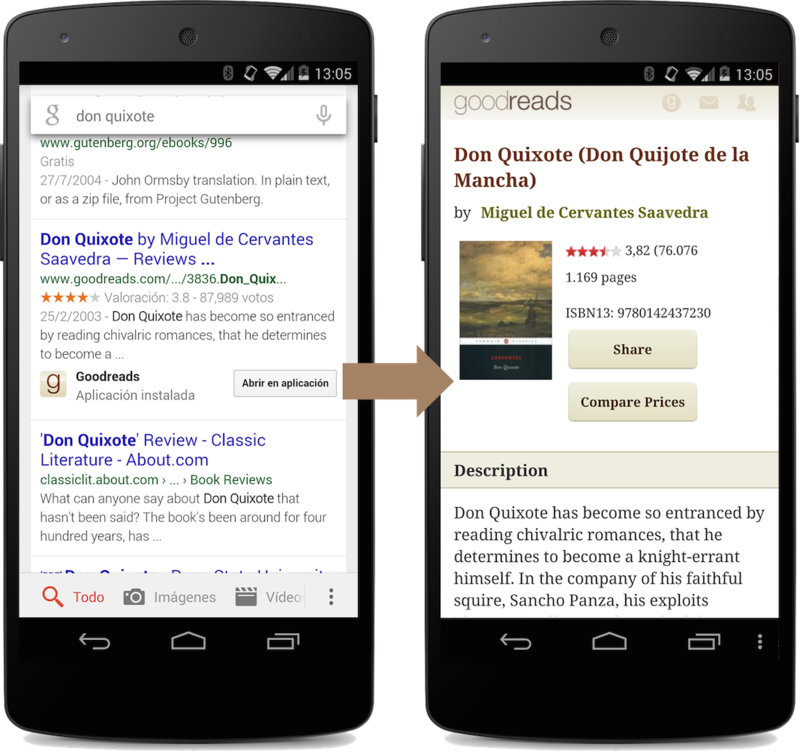 Do you have an Android app in addition to your website? You can now connect the two so that users searching from their smartphones and tablets can easily find and reach your app content. App deep links in search results help your users find your content more easily and re-engage with your app after they’ve installed it. As a site owner, you can show your users the right content at the right time — by connecting pages of your website to the relevant parts of your app you control when your users are directed to your app and when they go to your website. 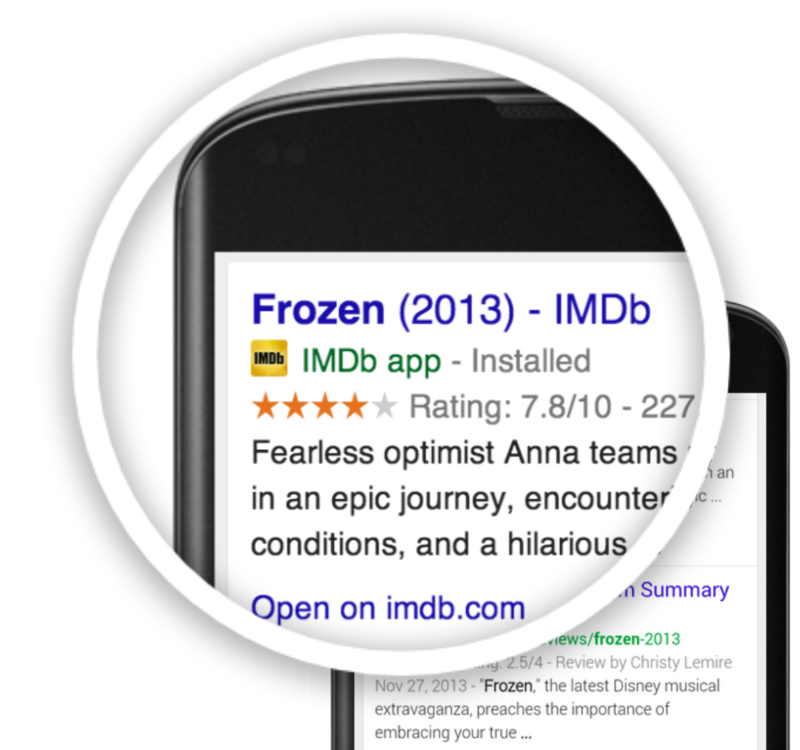 Hundreds of apps have already implemented app indexing. This week at Google I/O, we’re announcing a set of new features that will make it even easier to set up deep links in your app, connect your site to your app, and keep track of performance and potential errors. As we index your URLs, we’ll discover and index the app / site connections and may begin to surface app deep links in search results. Add a rel=alternate <link> element to specify the corresponding app URI. You can insert it in the <head> section of each web page, or in your sitemap. Find out how to implement these methods on our developer site. We’ll also give you detailed instructions on how to debug each issue, including a QR code for the app deep links, so you can easily open them on your phone or tablet. We’ll send you Webmaster Tools error notifications as well, so you can keep up to date. Give app indexing a spin, and as always, if you need more help ask questions on the Webmaster help forum. 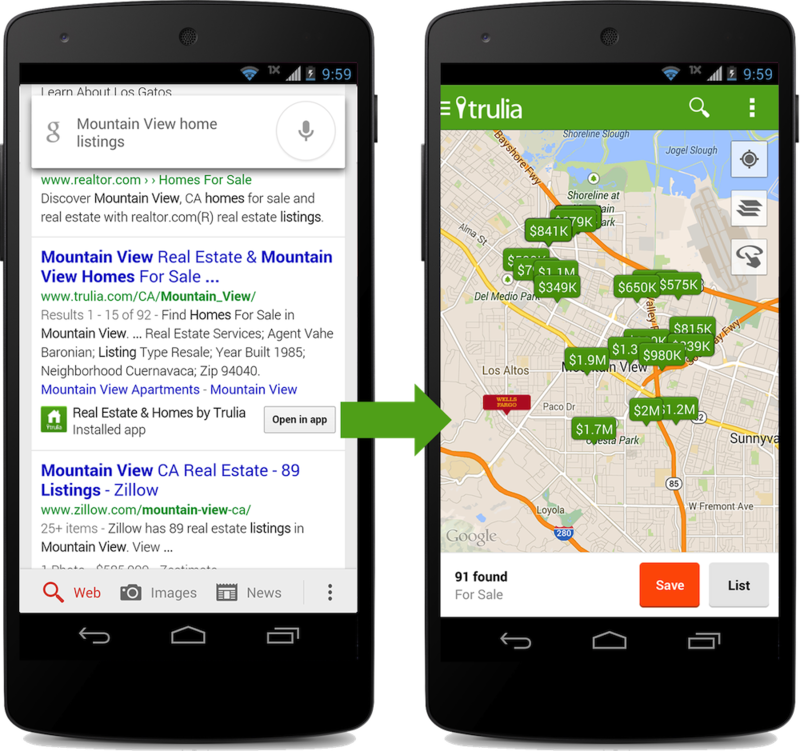 Posted on April 3, 2014, 9:41 pm, by Google Webmaster Central, under advanced, crawling and indexing, mobile, search results. 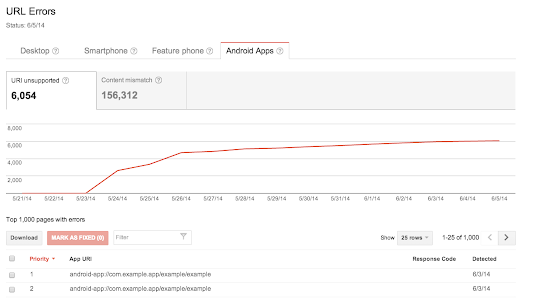 In October, we announced guidelines for App Indexing for deep linking directly from Google Search results to your Android app. Thanks to all of you that have expressed interest. We’ve just enabled 20+ additional applications that users will soon see app deep links for in Search Results, and starting today we’re making app deep links to English content available globally. We’re continuing to onboard more publishers in all languages. If you haven’t added deep link support to your Android app or specified these links on your website or in your Sitemaps, please do so and then notify us by filling out this form. 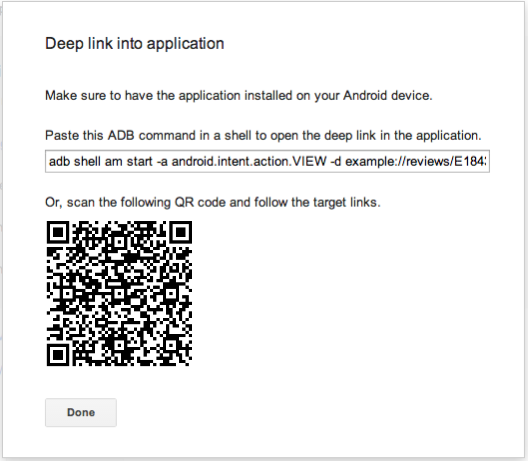 App deep links should only be included for canonical web URLs. Remember to specify an app deep link for your homepage. Not all website URLs in a Sitemap need to have a corresponding app deep link. Do not include app deep links that aren’t supported by your app. If you are a news site and use News Sitemaps, be sure to include your deep link annotations in the News Sitemaps, as well as your general Sitemaps. When Google indexes content from your app, your app will need to make HTTP requests that it usually makes under normal operation. These requests will appear to your servers as originating from Googlebot. Therefore, your server’s robots.txt file must be configured properly to allow these requests. Finally, please make sure the back button behavior of your app leads directly back to the search results page. For more details on implementation, visit our updated developer guidelines. And, as always, you can ask questions on the mobile section of our webmaster forum. Posted on January 7, 2014, 10:45 am, by Google Webmaster Central, under advanced, intermediate, search results, webmaster tools. Posted on December 18, 2013, 2:55 pm, by Google Webmaster Central, under advanced, beginner, intermediate, search results. Posted on October 31, 2013, 6:05 pm, by Google Webmaster Central, under advanced, crawling and indexing, mobile, search results. Searchers on smartphones experience many speed bumps that can slow them down. For example, any time they need to change context from a web page to an app, or vice versa, users are likely to encounter redirects, pop-up dialogs, and extra swipes and taps. Wouldn’t it be cool if you could give your users the choice of viewing your content either on the website or via your app, both straight from Google’s search results? 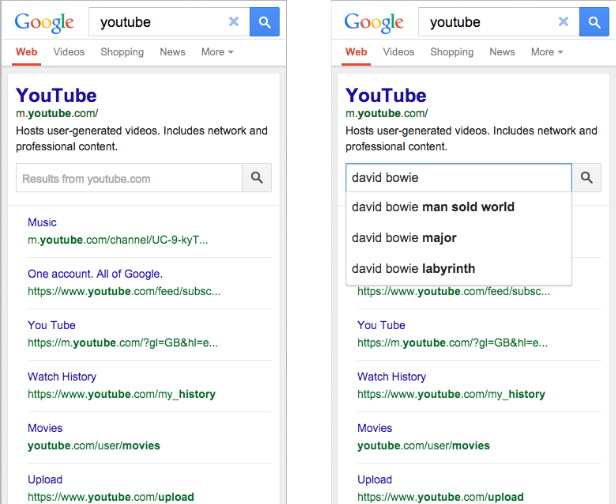 Today, we’re happy to announce a new capability of Google Search, called app indexing, that uses the expertise of webmasters to help create a seamless user experience across websites and mobile apps. Let us know that you’re interested. We’re working hard to bring this functionality to more websites and apps in the near future. 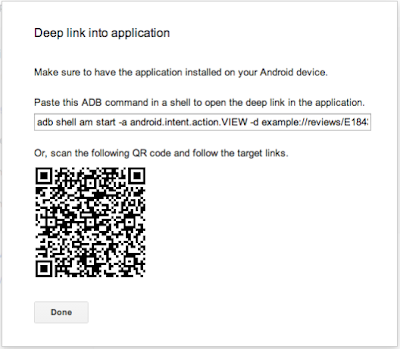 Enable deep linking within your app. Provide information about alternate app URIs, either in the Sitemaps file or in a link element in pages of your site. For more details on implementation and for information on how to sign up, visit our developer site. As always, if you have any questions, please ask in the mobile section of our webmaster forum. Posted on August 6, 2013, 6:05 pm, by Google Webmaster Central, under advanced, beginner, intermediate, search results. Users often turn to Google to answer a quick question, but research suggests that up to 10% of users’ daily information needs involve learning about a broad topic. That’s why today we’re introducing new search results to help users find in-depth articles. and of course, create compelling in-depth content. Following these best practices along with our webmaster guidelines helps our systems to better understand your website’s content, and improves the chances of it appearing in this new set of search results. The in-depth articles feature is rolling out now on google.com in English. For more information, check out our help center article, and feel free to post in the comments in our forums. Posted on May 15, 2013, 6:05 pm, by Google Webmaster Central, under advanced, beginner, intermediate, search results, structured data. Today, we’re launching support for the schema.org markup for organization logos, a way to connect your site with an iconic image. We want you to be able to specify which image we use as your logo in Google search results. This example indicates to Google that this image is designated as the organization’s logo image for the homepage also included in the markup, and, where possible, may be used in Google search results. Markup like this is a strong signal to our algorithms to show this image in preference over others, for example when we show Knowledge Graph on the right hand side based on users’ queries. As always, please ask us in the Webmaster Help Forum if you have any questions.